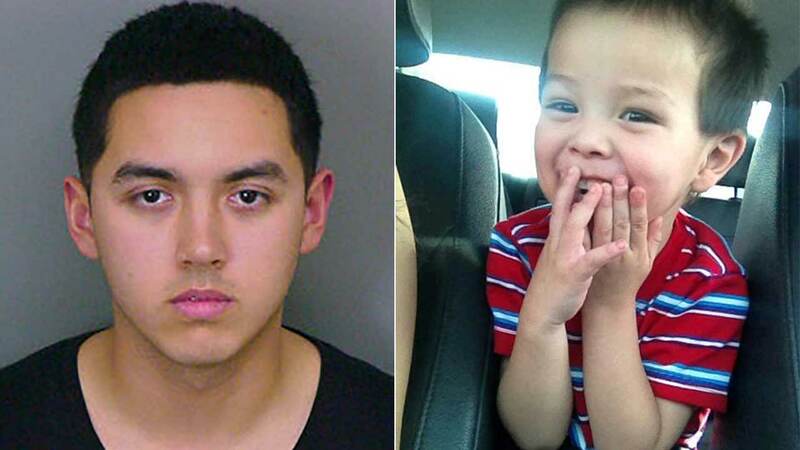 Michael Lucero, 22, of Ontario (left) was convicted of second-degree murder and assault on a child for allegedly beating 2-year-old Xzavier Taccati (right) to death. ONTARIO, Calif. -- A 22-year-old Ontario man was found guilty Monday of beating his girlfriend's 2-year-old son to death in 2013. A jury convicted Michael Lucero of second-degree murder and assault on a child causing death after deliberating for five hours. The boy, Xzavier Taccati, was taken to Kaiser Permanente Medical Center in Ontario on April 4, 2013 after he lost consciousness at his home in the 1100 block of East Philadelphia Street. Taccati was then transferred to Loma Linda University Medical Center where he died following surgery. The cause of death was blunt force head injury with a contributing cause of blunt force abdominal injury. Dr. Frank Sheridan, San Bernardino County's chief medical examiner, said Taccati had either been hit with a heavy object or his head was slammed against something. The boy had suffered a previous injury, laceration of the pancreas and damage to his bowel, which was caused by blunt force from a strong blow to the abdomen, Sheridan said. The suspect allegedly watched Taccati while his girlfriend was at work. Deputy District Attorney Karen Schmauss said Lucero was extremely jealous and controlling of his girlfriend. He faces 25 years to life in state prison when he's sentenced on Oct. 20.